At PMA 2010, HP set up a mock-store for customers to come in a print photo enlargements, collages, calendars, and photobooks. 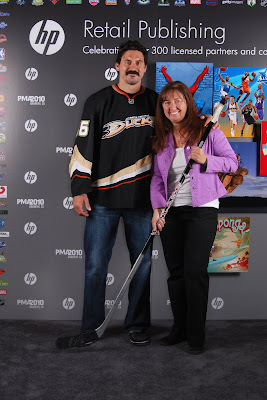 The also had a red carpet area for customers to pose with Batman, Spiderman, George Parros (Anaheim Ducks hockey star), and Spongebob. On Day one, the photographers at the booth were using point and shoots. HP printers can print such BETTER photos than little cameras can even take. Towards the end of Day 1, I made some friends with a lighting vendor down the way, and by the start of Day 2, we had a pro setup from lighting to lenses and customers were printing amazing photos!!! 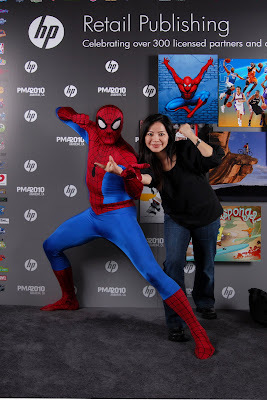 Spiderman was so animated, he stole the show! PMA was really small this year, downsized from the Vegas convention hall it had always been in. The number of people were even fewer, however, we managed to stay very busy. The booth had a great concept and was very interactive.